Dinko Telećan (Zagreb, 1974) graduated in Philosophy and English Language and Literature from the University of Zagreb. He works as an author, literary translator and editor. Selection from his works were translated into Catalan, English, Galician, German, Greek, Hungarian, Macedonian, Romanian, Slovakian, Slovenian and Spanish language. He translated over 60 books (novels, poetry, scientific books, books of essays and lectures, including authors such as J. G. Frazer, J. L. Borges, and Kahlil Gibran). His poems in English were published in anthologies Poets' Paradise, The Fancy Realm and Poetic Bliss (Guntur, India, 2010–12). He participated in numerous literary festivals around the world (e.g. in India, the Canarian Islands, Serbia, Romania, Greece…). 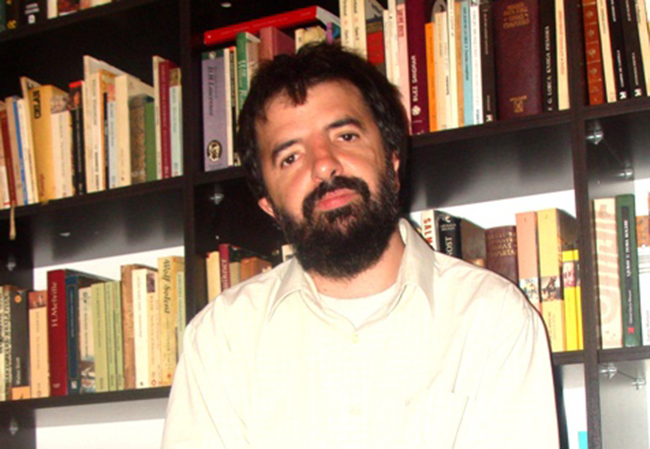 Telećan won various awards for his translations and essays, among them the annual awards of the Croatian Literary Translators' Association, as well as the Award for the best translation of non-fiction at the Sarajevo Literary Fair in 2006. Winner of the European Prize for Poetry at the Festival of Poetry in Curtea de Argeş in 2013. His novel Deserter won the Krunoslav Sukić Award for the Book of the Year promoting pacifism, non-violence and human rights (Osijek, 2014). At the Writers' Festival in Trivandrum in 2014 won the Sahitya Shree Award for his contribution in the field of literature. From 2004 to 2010 he was a member of the Board of Croatian Literary Translators' Association; he is a member of Croatian Writers' Association and Croatian PEN Centre, as well the Board of Croatian Writers' Association. What one notices from the very beginning when reading The Deserter is an enviable literary skill and baroque language, vivid and playful: readily recognizable Telećan’s style … With his sumptuous style, in terms of his motifs and sensibility Telećan still follows his own track, focused upon the parts of the world he’s interested in. On the micro- and macro-level of this novel his old obsessions are more or less evoked, yet some new ones also arise, in a way which is utterly pleasurable for reading. With this novel, Telećan makes his debut bravely and equally ‘deserter-like’ with regard to recent prose-production, but he does it in a sovereign, masterly and highly intellectual manner.